The business of healthcare is changing. IT should have the confidence and ready state strategy to meet the needs of their population health and community outreach departments. A recent survey of leading institutions revealed that one of the top five reasons healthcare providers (HCPs) have struggled to expand home-based monitoring as part of their population health management programs is an inability to provide technology service and support at scale. IT departments are being asked to take on roles that stretch them beyond their comfort zone. Some say IT organizations’ sole purpose is to “keep the lights on” within the brick and mortar facilities. They profess that IT’s role does not include supporting computer devices that patients use as part of their enrollment in a home-based monitoring program. For a moment, let’s agree... The number one job of the HCP’s IT organization is the management and functional maintenance of IT infrastructure within the health system, including externally facing applications such as patient portals. However, for most, supporting devices provisioned to patients for at-home use is beyond their scope and capacity. Yet, the business of healthcare is changing, and IT must keep up with the demands brought on by these changes. 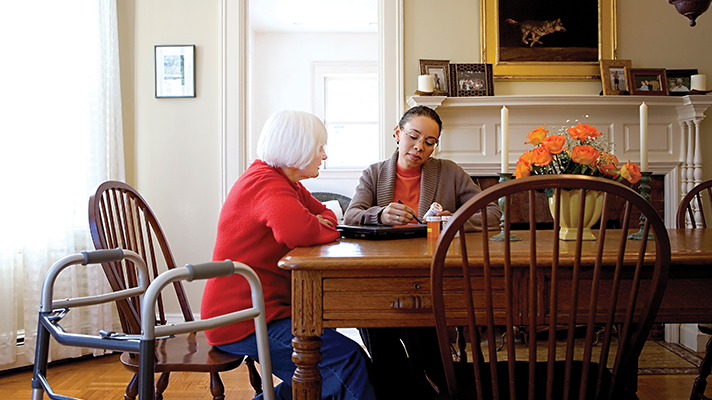 When asked to assist in the onboarding of home-based monitoring, IT should have the confidence and ready state strategy to meet the needs of their population health and community outreach departments. “We must consider factors beyond those related to the traditional healthcare system,” says Dr. Chris Gibbons, Chief Health Innovation Adviser, Federal Communications Commission, and CEO and Founder, The Greystone Group, Inc.
Like many, Dr. Gibbons views these nontraditional factors as only becoming more important as healthcare becomes more mobile, ambulatory, home and community based, personalized, and patient/consumer oriented. He explains that if we wish to enhance patient engagement, as is generally advocated by many, than the need for comprehensively servicing and supporting patients’ participation is vital. The reality is when IT departments are managing day-to-day routine tasks, like tech refreshes, security audits, and provisioning user accounts and access privileges, they may struggle to participate in the strategic decision-making process that will add to their business’s bottom line. This can stifle the innovative potential of an increasingly vital department, which given the way tech advances, no business can afford. This sentiment extends to their IT organizations. As a program administrator, there are a few tactics you can take to address these challenges up front, and successfully align your stakeholders. This is not all the work of the IT department. Not at all. Population health and community outreach teams need to think about and communicate a vision, not just a compromising list of demands. Work together to establish criteria for the selection of a third-party service provider and look for partners who understand health consumer behavior. Technology placed in the home setting may not have the same controls or structure that are in place in the confines of a clinical setting. You’ll want to think about how your healthcare consumers will be interacting with the devices and the health system from outside of your clinics. Most institutions want smart, simplified computing solutions that are easily deployed, tracked and supported. What if you could easily add or remove managed patient enrollees and enrolled devices? How might managed oversight of enrolled patients and devices yield better insights and opportunities for early intervention? Continuous improvement is a must, and as a result, programs often change course. What if you could request and default application deployment and updates easily and without hesitation? How convenient might it be to have the ability to move requested apps from a healthcare consumer’s Device App Catalog? Downtime is not an option for devices being deployed for remote monitoring. Imagine the confidence and trust built between you and your patients when devices are monitored. What would it mean to you, your patients and their personal caregivers to know you will all be notified when a device health issue is detected? Imagine the benefit of shifting device investments from the CAPEX side of the ledger to the OPEX side. We all know that CFOs are mindful of many factors when determining expenditures, and each year brings new considerations—this will help keep your program more financially predictable and thus more financially manageable. This is also a really nice way to stay in line with reimbursement caps. For more on remote patient management, visit hp.com/go/healthcare. Continue the conversation at HP’s booth #3741 at HIMSS19.